Is 2014 Your Year to Join The Compact and Stop Buying New? Unhappy With Your Family’s Gift Giving Culture? So Do Something About it Already! “Living The Dream: Non-Consumer Advocate Katy Wolk-Stanley.” Center for a New American Dream, by Edna Reinzi, November 11, 2013. “How I Found Financial Freedom,” Daily Worth, by Terri Trespicio, July 2, 2013. “The Money Habit That Saves You $1,378 Every Year,” Redbook Magazine, by Sandy Fernández, July, 2013. “I Haven’t Bought Anything New in Over Six Years” Irish Independent, by Lisa Jewell, January 8, 2013. “10 Ways to Fight Back Your $1000 Payroll Tax Hike,” Time.com by Martha White, January 8, 2013. “Why I Did The Food Stamp Challenge,” Katie Couric, December 14, 2012. “5 Ways to Rethink Gifting This Holiday,” KQED, December 5, 2012. “KQED Radio: Forum” Alternatives to Buying Gifts for the Holidays, November, 23, 2012. “How I Learned to be Frugal Without Freaking Out” The Vanguard Group, November 16, 2012. 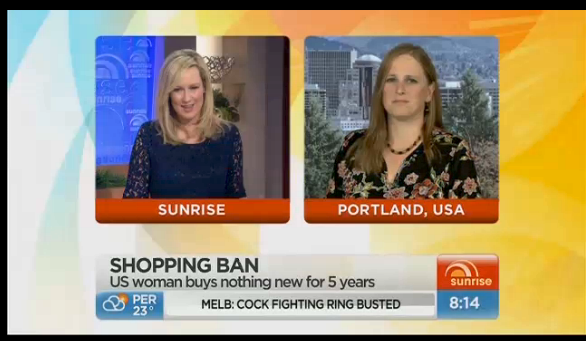 “Nothing New For Five Years” Sunrise TV, Australia, September 10, 2012. Woman Who Has Not Bought Anything New in 5 Years, WGN Radio, August 29, 2012. “Why I Stopped Buying Almost Anything New” Today Show, August 23, 2012. “Get More Joy From Your Money” Ladies Home Journal, by Sandy Fernandez, August 2012. “Reader Interaction: What Would You Suggest to Do With Tiles Painted by Dulcy Mahar?” The Oregonian, by Peggy McMullen, October 8, 2011. “The Benefits of Buying Virtually Everything Used,” Time: Moneyland, by J.D. Roth, October 7, 2011. “Buy Used: Save Bucks, Live Better, Live Better,” Marketplace Money, by J.D. Roth, September 25, 2011. “CREATIVE READER: Katy Wolk-Stanley Uses Old Maps in a New Way,” The Oregonian: Home & Gardens, May 28, 2011. “4 Foolish Ways to go ‘Green’ ,” MSN Money, by Liz Weston. April 1, 2011. “I’m a Person Who Has Always Relished Time Alone,” The Happiness Project, by Gretchen Rubin. March 24, 2011. “A Non-Consumer Christmas: Simple Gifts for Kids and Grown Ups,” Get Rich Slowly, by Sierra Black. December 16, 2010. “The Non-Consumer Advocate’s Guide to Frugal Living,” Simpler Living, by Naomi Seldin. August 18, 2010. 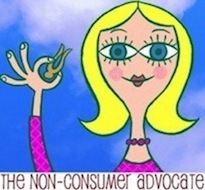 “This is What Frugal Looks Like: Katy from The Non-Consumer Advocate,” Almost Frugal.com, May 20, 2010. “Living a ‘Less than Average’ Life: Entertainment,” WalletPop, by Martha C. White. March 31, 2010. “The Big Chill,” National Enquirer, by John Cook. March 1, 2010. “Portland Family Takes Part in Chilly Challenge,” KGW Newshannel 8. December 16, 2009. “How Low Do You Keep Your Thermostat?” WCCO News Radio, Joe Anderson. December 15, 2009. “Households Take up Challenge to be Chilly,” USA Today, by Laura Bruno. December 13, 2009. “NJ Household Compete in Challenges to Keep Thermostat Off in Winter,” The Star Ledger, by Kelly Heyboer. November 15, 2009. “The New Age of Thrift: How Long Will Americans Continue to Embrace Frugality?” MSN Money, by J.D. Roth. October 9, 2009. “Blogger Becomes a Force For Frugality”The Oregonian, by Anne Laufe. October 8, 2009. “Thrifty Threads” My Year Without Spending, by Angela Barton. September 10, 2009. “The Non-Consumer Advocate,”Simpler Living, The Times-Union, by Naomi Seldin. September 9, 2009. “How to Embrace Your Inner Cheapskate,”ABC.com, by Mary Bruce. July 16, 2009. “Austere Times? Perfect,“New York Times, by Matt Richter. April 10, 2009. “The New Age of Thrift,”Get Rich Slowly, by J.D. Roth. May 4, 2009. “Keeping it Simple,” Metro Parent Magazine. By Anne Laufe. (Starts on page 14.) April 2009. “Putting Santa on a Budget,”MSN Money. By Abby Ellin. December 11, 2008. “The Great Black Friday Markdown,” The Washington Independent. By Mary Kane. November 28, 2008. “Buying Into a No ‘News’ Lifestyle,” Eugene Register Guard. By Diane Dietz. January 2, 2007. Regular column in The Alameda Sun. Click here to find index to back articles. Just type “Katy Wolk-Stanley” in the search box.